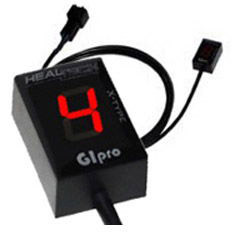 Gives you total control over your windshield height, angle and airflow for the most comfort. Madstad accomplishes superior airflow by separating your bike's windshield from its fairing with the patented adjustable RoboBracket system. By scooping air up under the windshield, it eliminates the vacuum normally generated behind your screen which causes turbulence and buffeting. 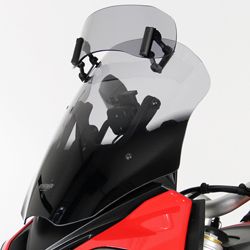 Your new windshield will then be fully adjustable for height, tilt and depth (distance from the rider). With the windshield raised from the fairing, air can flow underneath, eliminating the turbulence-causing vacuum behind it and giving you total control over the airflow and position of your shield, meaning one size shield will work perfectly for many different height riders. Transform your ride with MadStad RoboBrackets, an adjustable wind management system that allows you to control the position and angle of your motorcycle windshield. 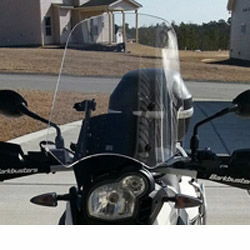 The result is much smoother airflow, better wind protection and a more comfortable ride than any fixed windshield could ever provide. Why adapt to your windshield when your windshield can adapt to you? - Highest quality aircraft-grade screen produced for HPS in Germany by MRA under licence from Madstad to exact Madstad specification and design. The mounting for the RoboBracket system is a black powder-coated Aluminium base which simply attaches directly to your bike's existing mounting holes. The adjustable RoboBrackets bolt to this base and the windshield attaches to the brackets. Your kit will include everything needed to mount your RoboBracket system, including the adjustment tools to position your shield, so your bike will not require any further modification. !screens, 11, 12, 13, 14, 15, 16, 17, 18, 19, 20, 2011, 2012, 2013, 2014, 2015, 2016, 2017, 2018, 2019, 2020!